I have done some mystery shopping here and there, and I’ll admit that it’s a fun way to earn some side income. I’ve also known others who go full-force with it and earn almost a full-time income using a few different companies. Mystery shopping isn’t the right choice for everyone, but it can be a way to earn money without a 9 to 5 job. You can usually make somewhere around $10 to $25 per mystery shop task. It’s not bad, considering most shops don’t take more than a few minutes of your time. 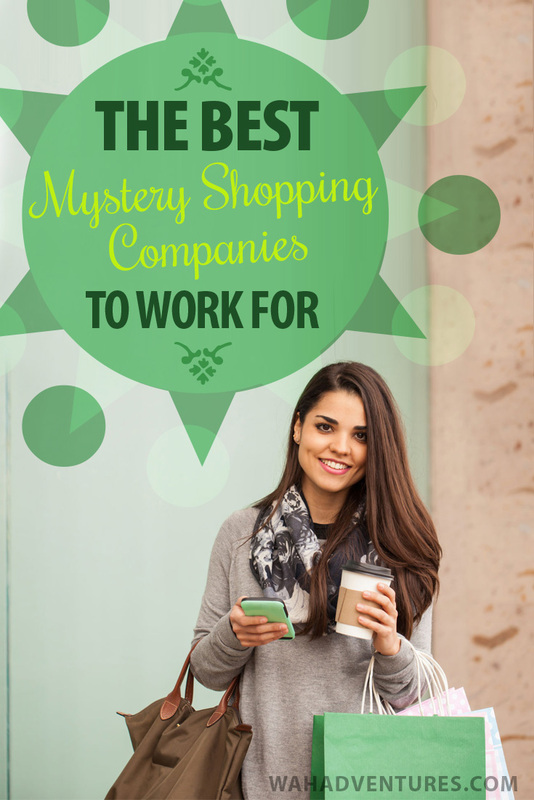 Here’s everything you need to know about mystery shopping and the best companies to start with. What Do Secret Shoppers Do? What is mystery shopping and what will you do as a secret shopper? All mystery shopping companies do things a bit differently, but the general idea is the same. You visit a specific store, complete specific tasks, and provide feedback of your experience. Some mystery shopping companies focus on telephone mystery shops only. For these, you’ll call a store, ask specific questions, and then complete a follow-up survey. By mystery shopping, you help store owners learn what areas they need to improve on. For example, say you completed a mystery shop at a grocery store. You were required to ask an associate for help locating the toiletries. You might point out that customer service was lacking. The owner will see, from your feedback, that some more customer service training might come in handy. Like most jobs, mystery shopping isn’t perfect. One of the biggest downfalls is work may not be steady. Mystery shops may come and go – you could have some busy weeks and then go months with barely any work. It can be difficult to rely on a steady paycheck from mystery shopping. You also need to prepare to shop with your own cash up front. Most mystery shopping companies don’t pay you first to shop – your payment comes later. That means that whatever you’re required to purchase comes out of your pocket. In many cases, your performance can affect your pay, too. If you don’t hit all the requirements, you may not get your full – or any – payment. You’ll also be responsible for gas to get to and from the store and paying your own taxes (you’re technically self-employed). So, the costs can add up quickly. Of course, if you’re strategic about the shops you choose – like picking ones close to you that pay a good rate – then you won’t lose out on cash. Mystery shopping doesn’t typically take special skills other than excellent attention to detail. To get started, it’s usually as simple as finding reputable companies you want to work with and signing up for a few of them. Sign up for as many as you can handle, since more companies will mean more paid opportunities. When one company is slow with shops, another one may have several to offer. Make sure you have reliable transportation, since your car is your way to get to a shop. And, a reliable computer is just as important. Your computer is usually how you’ll submit your reports for shops. Once you have the basics, you’re all set! A Closer Look requires its mystery shoppers to take a test as part of the application process. It focuses on basic math, grammar, spelling, and logic to make sure you will accurately be able to complete the shops. The test should only take about 10 minutes. The entire application process takes about 30 minutes. You’ll need to submit a small narrative about a recent store or restaurant experience so the company can judge your critiquing skills. About Face has over 200,000 mystery shoppers and consistently recruits more. It’s an accredited business with the BBB and includes mystery shoppers from the United States and Canada. Payment depends on complexity of the shop and your previous performances. This company seeks mystery shoppers in Canada and all states except Nevada. The independent contractor application will take between 15 and 30 minutes to complete. You can choose to get paid via PayPal, which will be released between 21 and 28 days after a shop is completed. Pay depends on the shop, but you can earn an extra $5 if you return your completed shop earlier than the deadline. Amusement Advantage also offers a $10 referral bonus. Independent contractors who love to shop in person can fill out the quick registration form for Anonymous Insights to have their profile added to the roster. Shops will then be added to the job board when they’re available in your area and you can choose which ones you want to participate in. By the 10th of the month following the completion of your shop, you’ll get paid via check, but the company is looking to switch to PayPal in the future. BestMark seeks mystery shoppers with excellent attention to detail and adherence to deadlines. Most shops have a turnaround time of 24 hours. Most payments are made within four weeks of shop completion. Payment is only available via check. Clear Evaluations partners with independent mystery shoppers for a variety of shops, including web-based, phone, and in-person. The company works with clients in several industries, from auto dealerships to retail stores. You can click this link to go to the registration form. Once you’re signed up, you’ll be able to access the job board with open shops in your area or that match your interests. Confero has both in-store and telephone mystery shops, but most are in-store. The company seeks shoppers for price checks, on-site audits, compliance audits, and traditional mystery shops. Confero updates the job board daily and you can choose from available shops. Shops are available in the United States, Canada, Mexico, and South America. Coyle Hospitality Group uses evaluators to help shape a variety of businesses it partners with. The link to the signup page is currently not working, but you can always contact the company using its provided email to inquire about open positions. Customer Perspectives requires its mystery shoppers to have excellent writing skills so that they can accurately fill out the follow-up forms from their shops in detail. You also must have reliable internet access, as you’ll receive assignments via the web-based communications system. Mystery shoppers can be located in the US and Canada and can sign up using the short form on the registration page. This company focuses on apartment mystery shops. Independent contractors will post as customers interested in becoming a potential tenant in an apartment complex. You may need to ask specific questions, purchase a product, and browse the grounds like you would if you were considering an apartment there. Once you complete an application, you’ll need to complete the tutorial, and then you’ll have access to open opportunities for which to apply. If you love very quick mystery shops that you can fit easily into your schedule, then Field Agent is perfect for you. This app shows tasks near you that you can typically complete in just a few minutes (you’ll have two hours to do it once you accept it). They’ll involve things like visiting a store and giving feedback on its promotions, customer service, or cleanliness. Once your tasks get approved, you’ll get paid within 48 hours. GPW looks for retail auditors, which are a bit different than traditional mystery shoppers. You’ll announce your visit to the store and complete an audit of its procedures, safety measures, compliance, etc. You must be 18 or older to join. GBW pays auditors once per month. GFK seeks mystery shoppers in North America. You can self-assign jobs that you’re interested in using the GFK job board. You must complete your shops within 12 hours of acceptance to get payment. Gigwalk is an app and website that connects independent contractors with people who need stuff done near them. Some tasks can include mystery shopping, like visiting a local restaurant and giving feedback on your experience. Others are more service-based, but you can always browse open opportunities near you and respond to mystery shops when they’re available. Gigwalkers get paid with PayPal once their work is approved by the platform. IntelliShop is another company that allows you to choose your jobs through its job board of available shops. Some can also be assigned directly to you. You’ll need to confirm these within 24 hours. Shops must be completed within 12 hours, but you may be granted an extension if you ask for one. Payments are made via PayPal about 30 days after a completed shop. InTouch Insight works with both retail and food brands to deliver quality feedback given by mystery shoppers. When you register to become a shopper, you can access a list of open jobs near you. Request the ones you want and wait about 48 hours for a reply. If accepted, you can get started using the given instructions. Shoppers get paid every other Friday for the work they do. Jancyn works with companies in retail, food, financial, and other top industries to help them improve their customer service and overall customer experience. Once you sign up and get entered into the database, you’ll be able to see the current jobs available for you. Shops need to be completed within 12 hours of visiting the location. You’ll need to provide detailed feedback about your experience that will help each client improve every customer visit. JM Ridgway offers a wide range of services for business that help them improve their service, and mystery shopping is one of them. Accepted shoppers will be entered into a database called SASSIE where they can search and apply for open jobs. All payments are made with PayPal between 30 and 45 days after a completed shop, but the pay will vary with each project. MarketForce is easily one of the most popular mystery shopping companies. It provides mystery shops in a wide range of industries, such as automotive and movie theaters. Most shops take between one and two hours. You must be at least 18 to apply and have a high school diploma. You’ll get paid once a month via direct deposit or check. This company features a variety of mystery shopping types, like visiting auto dealerships, giving feedback on a dining experience, and pretending to open a checking account at a bank. Person to Person Quality pays for each shop with PayPal, so only those who are able to use the platform can get paid. Once you accept the shopper agreement and register, you can start browsing available shops to complete. Once you sign up for Pinnacle, you can use the job board to search for interesting shops near you. You must complete your survey within 12 hours of accepting a shop. You’ll be graded on a 1-10 system. Your grade includes your accuracy, detail, dependability, and writing skills. The higher your grade, the likelier you’ll be granted shops. Shops pay between $4 and $75 each, depending on the type. Pays once per month with PayPal. Quest For Best offers a flexible way for mystery shoppers to get paid completing shops in their spare time. Just sign up, fill out your profile, and be entered into the database of open shops in your area. The company doesn’t tend to have a very active list of shops according to reports, but it will keep your name and information on file for when something does come up. You can choose to accept or deny any shop that comes your way, depending on when you’re available and if it fits into your schedule. Secret Shopper is a bit different than other companies. It offers on-site shops, telephone shops, and online shops. The online mystery shops include testing and evaluating websites, taking surveys, and an online business analysis. Shoppers can potentially have a lot of available opportunities with Secret Shopper. Most shops pay between $12 and $25. Second to None seeks mystery shoppers from the United States and Canada. You can complete your shops via a computer, tablet, or smartphone, so at least one of these is required. The company has traditional mystery shops, compliance audits, and customer surveys to choose from. When you apply, you’ll have instant access to the job board. This marketing company offers mystery shopping as one of its services to help businesses improve their structures and customer service. Those with excellent observation and writing skills can apply for mystery shopping positions, which are mostly on-site shops. To apply, you’ll need to fill out a quick form and agree to the terms for mystery shoppers, after which you should be able to login and see open shops. Service Evaluation Concepts looks for “Brand Agents,” which is its term for someone who performs shops. These shops are mostly customer service-based shops, so you’ll be evaluating the customer experience businesses from the customer point of view. You can become certified here, which opens you up to more opportunities. Once you become a Brand Agent, you can elect to take the certification course for valuable resources and more earning potential. This company uses an advanced reporting system and portal that provides mystery shopping with training, an easy way to complete reports, performance reports, and more. You can even participate in video mystery shopping using a hidden camera to capture your interactions with employees. To apply, you’ll need to fill out the application, a new shopper survey, and a “New Shopper Challenge” to see how well you’d perform shops. ARC Consulting provides telephone mystery shopping opportunities. You’ll call its clients’ locations posing as a customer and you’ll provide detailed feedback of your experience. The company hires all of its applicants as phone mystery shoppers first. Based on performance, accuracy, reliability, and other factors, you may then be able to perform phone audits, which can give you more money. Call Center QA hires United States telephone mystery shoppers. You must be at least 18 years old to apply. This company is one of the most popular, mostly because it’s so transparent with its terms. Its website clearly states that each shop pays $5, which includes the 5-10 minute shop and brief follow-up survey. So, you could potentially earn about $20 per hour with consistent shops for Call Center QA. Additionally, the company pays for shops within 7 business days or less. There’s also a referral program that opens occasionally where you can earn money from referring your friends. Intelicheck hires mystery shoppers in the United States and Canada. It often has positions available for bilingual telephone mystery shoppers as well. Intelicheck prefers its candidates to have at least 6 months of call center or telesales experience, but it’s not a requirement. You’ll need to be able to commit to 10 to 30 hours per week between the hours of 8am or 7pm EST. The job will consist of calling businesses to inquire about the products and services they offer. The job description states that most shoppers earn between $9 and $14 per hour. Perception Strategies focuses on healthcare mystery shopping. You’ll be asked to complete a sample shop as part of the application process. The company currently seeks mystery shoppers in specific areas of the United States; the list can be found on its website. TeleXpertise offers a variety of inbound and outbound call center services to clients, including telephone mystery shopping. You can apply by sending your resume directly to the e-mail listed on the contact page. Yardi-Matrix’s telephone mystery shopping jobs are a bit different than others. Known as “surveyors”, its shoppers call apartment communities to conduct surveys that ask information about rent prices, office hours, amenities, etc. Yardi-Matrix pays a base rate of $6 per hour, plus 50 cents per call. You’ll also still earn some pay for wrong numbers, partially completed surveys, and no-answer calls. Read More: Best 22 Online Coupon Sites For 2019: Save Money Shopping Online! Unfortunately, there are a lot of mystery shopping scams out there. One in particular was called Experience Exchange. Apparently, Experience Exchange mystery shopping was a highly-touted one that’s suddenly no longer in existence. When a company goes as easily as it comes, it’s a big red flag for a scam. Even the Federal Trade Commission (FTC) warns against mystery shopping scams because it’s so easy to get fooled by them. And, scam companies set out to prey on desperate people looking to make quick money by mystery shopping. The FTC says it’s important never to pay for a mystery shopping job. If a mystery shopping company asks for money in any way before you begin work, report it. Read plenty of company reviews and spend some time researching the company online before you get started. If it lacks information, it may not be legit. Does mystery shopping sound appealing to you? If so, try it out! Don’t forget to come back here and let us know how it went in a comment. Hi, as usual, your list is very detailed and helpful. I was wondering if you know of any virtual mystery shopping sites that are open worldwide? I have been looking for work at home jobs for international members. TeleXpertise is gone-I get only an error page! maybe they were also scammers or a failure.